Erin's Character Design Roulette Challenge! I've been working on improving my story-telling skills over the past few months (thanks to Andy J Miller's amazing MFBA class I took this spring). Every good book has a good story at its heart, and every good story starts with a good character. I've always loved character design, but I needed to give myself a challenge - something that I could really sink my teeth into creatively. Often when I sat down at my desk, I wouldn't know what to draw, other than the same old faces with the same old look. Artist's block was a frequent frienemy. I needed an exercise to help me push past that, and into the process of creating freely. So I came up with this random character design roulette sheet (you can download it here). The idea is that you draw a random squiggly line, and then have to use the elements your line crosses over. If your line crosses over multiple elements, you can choose between those ones. Once your specifications have been chosen, you draw the character and make up a story about him/her/it. Here, the elements I randomly got were BEAR, PARENT, BLACKSMITH, JUNGLE/TROPICS, & ANCIENT (meaning any ancient civilization in between prehistoric and medieval times). So I decided, because we were dealing with a bear who was also a parent, that it should be a momma bear. I then thought of which ancient civilizations happened in the tropics, and landed on the Mayans. 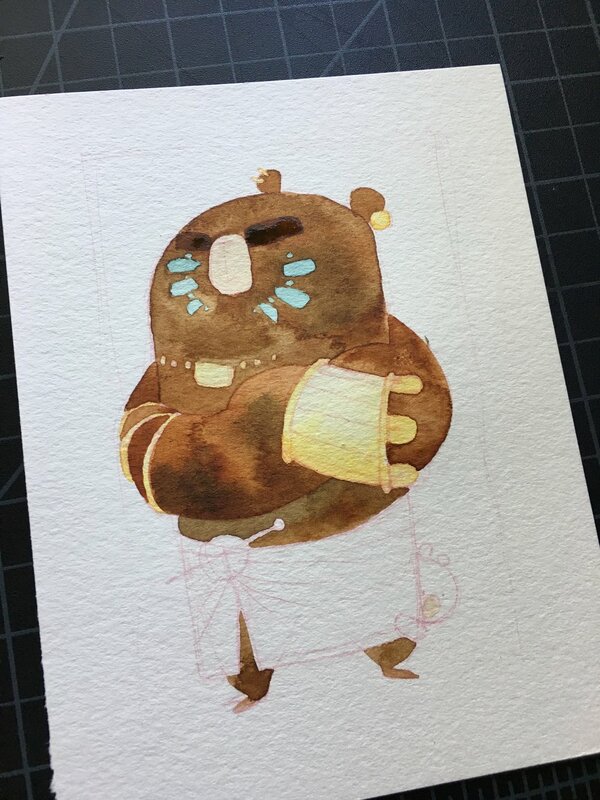 Then it was clear that not only would this momma bear be a blacksmith, but she would specialize in gold. I did some research on the Mayan people, gathered some patterns and symbols and names, and started sketching. I really loved the way the parameters of the chart made me think creatively about these characters, stretching my mind in a way it wouldn't have ordinarily. If you're interested in doing the challenge with me, you're more than welcome! I'm using the hashtag #characterdesignroulette for all the concepts I come up with using the chart. If you have any questions, feel free to email me or message me on Instagram.